John and Megan met through mutual friends during a party. They began actually hanging out the summer of 2013. Years later in their relationship, they would take a trip to Paris, which would also be Megan’s first visit to Europe. After a long commute, and oncoming jet lag, the couple got lost on their way to the hotel. After a brief nap, John woke up Megan and convinced her to see the Eiffel tower with him even though she was tired and just wanted to relax that night. Once at the Eiffel tower, near the entrance, John asked Megan to put her phone in a selfie stick while she complained, knowing that they would both share pictures once they got home. After arguing she eventually did place her phone in the selfie stick, only to turn around and find John on one knee proposing to her. Megan said, “It’s a really funny story to tell people now”. Megan had always assumed she would get married in Minnesota, but after John suggested an option of having an intimate wedding on a beach, Megan realized she was open to the idea. Megan was initially nervous about asking friends and family to pay to travel. However, they brought up the idea to family members, and they were all supportive of it. They wanted Costa Rica because Megan desired a unique location. She said, “We had been to Mexico, he had been to Jamaica, so we wanted something different”. Together with their Destify agent Ann, they went through multiple resort recommendations. They chose the RIU Palace Costa Rica because it checked off all the boxes on their list, it was budget friendly and kid-friendly too. The couple even found an RIU Facebook group where they could ask questions related to the wedding and the resort from other people who had stayed there. Once on site the couple and their guests took full advantage of their beautiful location. They held a special excursion for the entire group once everyone had arrived, which would also double as the couples’ rehearsal dinner. A catamaran took the guests to a reef to snorkel and kayak and afterward drinks were served on the return trip. Once everyone had arrived back at the beach there were tents set up serving more drinks and a delicious dinner. It was John and Megan’s way of saying thank you to their guests for attending. The couple got married on the beach at sunset. The weather was warm, and they actually started their ceremony 20 minutes early to avoid the incoming rain. After, John and Megan took couple photos, while briefly taking cover under a tree to dodge a trademark Costa Rican sprinkle. 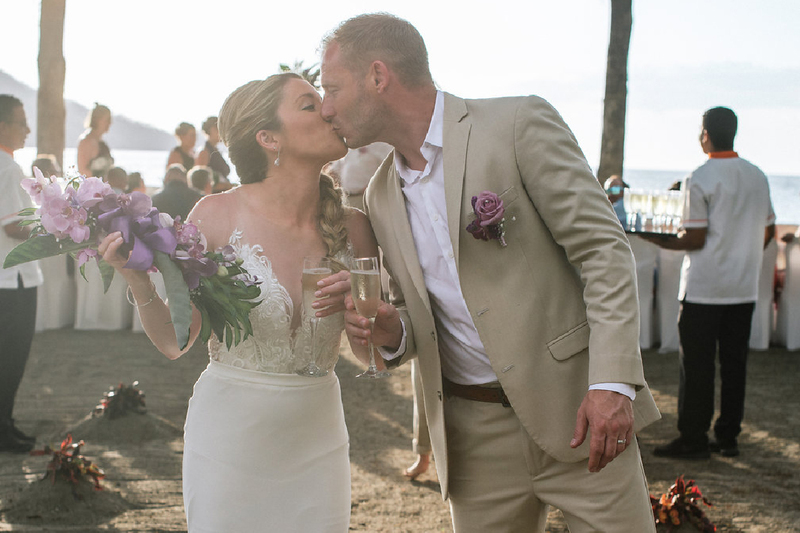 Following the ceremony, the couple hosted an semi-private dinner reception at the resort’s Papagayo Steakhouse and rented out the Coconut Bar for a private function that included the couples’ first dance. More than half of their guests used the trip as their own vacation, and everyone went on further excursions to explore the amazing country. The couple agreed that “island time” is a real thing, and although communication may not be the fastest back and forth with your wedding department, you can still trust the process, as they know what they’re doing. Everything turned out better then they could have imagined. All of our guests bonded and had the best time! A lot of us have continued that bond at home and plan regular get-togethers now.